Conducting Financial Activities Online—What’s the Frequency, DC Plan Participants? Defined Contribution plan participants are most likely to use their PC/Macs rather than their tablet or smartphone to conduct many financial activities online, according to Spectrem Group’s “Wealth Segmentation Series” report, Using Social Media and Mobile Technology in Financial Decisions. Eighty percent of DC plan participants use their PC/Mac to access information and conduct transactions for their retirement plan. A majority of DC plan participants are also using their PC/Mac to pay bills (68 percent) check their account balance or access personal financial account information (67 percent), and deposit funds or transfer money (63 percent). Just over four-in-ten report they buy, sell or trade stocks on their PC/Macs. Between tablets and smartphones, DC plan participants report they would be most likely to use their tablets for these financial activities. 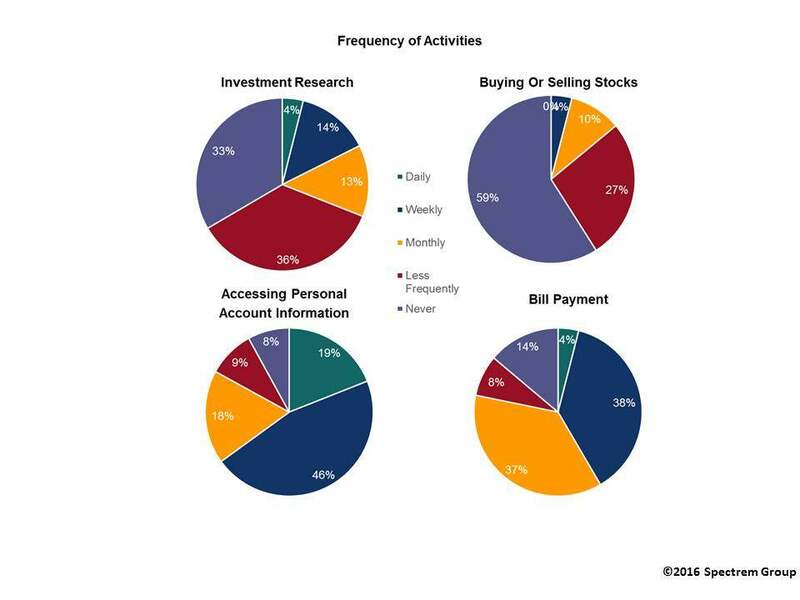 How frequently are DC plan participants conducting financial activities online? It depends. Roughly six-in-ten report that they never buy or sell stocks online, while 27 percent perform this task less frequently than monthly, weekly or daily. When it comes to accessing personal account information via the internet, 19 percent do this on a daily basis while almost half (46 percent) do it on a weekly basis. Less than 10 percent say they never access personal account information online. Bill payment, not surprisingly, is the next most frequent financial activity conducted online. Almost 40 percent do this on a weekly or monthly basis. The largest percentage of DC plan participants are conducting investment research online less frequently than daily, weekly or monthly, and one-third say they do not use the internet at all for this purpose. Thirteen percent said they go online to conduct investment research on a monthly basis. With current usage of mobile technology highest among participants under 35 years of age, continued growth is assured through these devices. Plan sponsors and advisors will want to remain on the cutting edge of technology rather than play catch-up. · It is important to communicate to DC plan participants the types of information and services you offer via online. If they don’t know they have these options, they won’t use them, and the more they use them, the more comfortable they will become with them. · Plan sponsors should be asking their employees what information they want and how they want to receive it. Your website design should be as user-friendly as possible to encourage usage and frequency of visits. · Does your website have an app? DC plan participants who prefer an app to using a browser contend it provides information more quickly.